When India was jubilantly celebrating the Olympic Silver medal won by PV Sindhu after her final match, social media, from somewhere, discovered that people are searching caste of Sindhu. As claimed by some people on twitter, the predictive algorithm of Google search was giving PV Sindhu caste as top keyword for searches on PV Sindhu. The news took no time to spread on different platforms. Soon, the unconditionally joyous mood of many people drifted to a conscience-stricken shamefaced state. This was shocking to me too. To confirm this, I tried to use both “PV Sindhu” and “P V Sindhu” as keywords. My results didn’t have “PV Sindhu caste” on top of the search results. On 20th August, the news was rife on the national dailies. Media claimed that people were searching Sindhu’s caste when Sindhu was playing her matches. I don’t remember any past instance when I saw people around me searching caste of players during their matches. However, seeing how stories and outrages are getting built around caste and religion of people these days, I was dubious about this whole episode. If they were, they are less than 1% of the searches on ‘Sindhu.’ That red line stays at 0 throughout. And then I wondered which cities may have searched for her. Naturally I assumed ‘Hyderabad’, what do you think? His findings address that the prime allegations put by media was illogical. The volume of searches for “PV Singhu caste” was not even 1% of searches for “PV Sindhu” which meant that media again generalized and exaggerated the data. I tried to analyze google trend behind “PV Sindhu Caste” and found similar results. 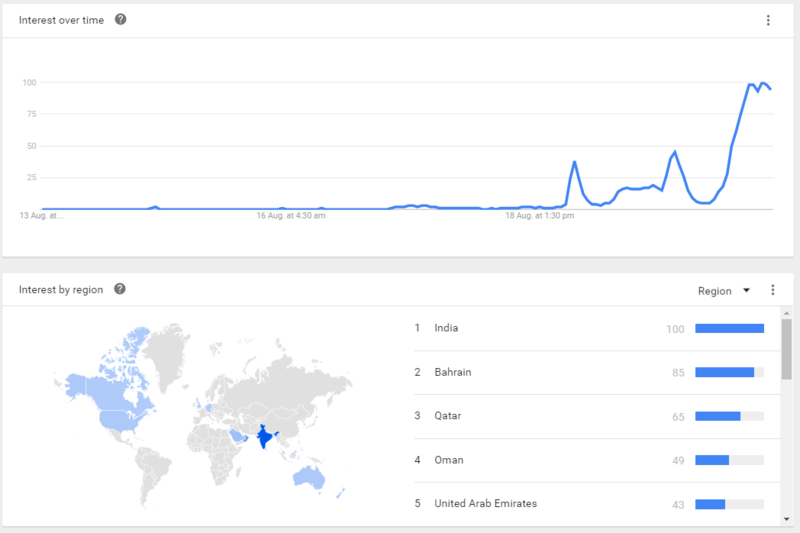 However, you can see that searches for “PV Sindhu” caste is rising. So what explains this? Let me try to give a probable reason. You can clearly notice that after 19th August, searches for “PV Sindhu caste” increased, dipped and then again increased. On 19th August, some people deliberately started caste and Dalit controversy. With more number of people tweeting similar texts, it would have intrigued more people to check her caste. The controversy picked as soon as the match ended. More and more people would have started checking it. Google pushes more searched keywords towards top of the predictive results. On 20th media started publishing reports around it. This resulted in even more volume of searches for her caste. The artificially created search was presented as the tragedy of Indian society. 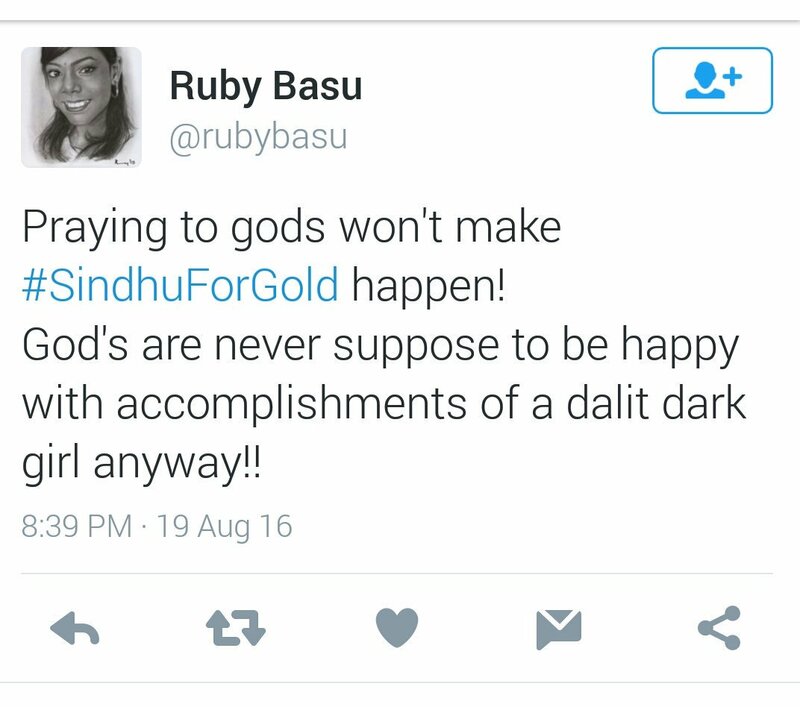 It should not amaze us that people are forcibly trying to use caste narratives in all possible spheres of life. However, it is also interesting to see names of those countries where “PV Sindhu caste” has maximum search after India; they all are from the Middle East.